Jean-François Pilâtre de Rozier (1754-1785) was french science teacher and a pioneering balloonist. He and the Marquis d'Arlandes made the first recorded manned free balloon flight in a Montgolfier balloon in 1783. Unfortunately he and Pierre Romain were the first recorded casualties in an air crash (unless one counts Icarus in Greek mythology) two years later, when they attempted to cross the English Channel in a balloon and crashed near the French coast. 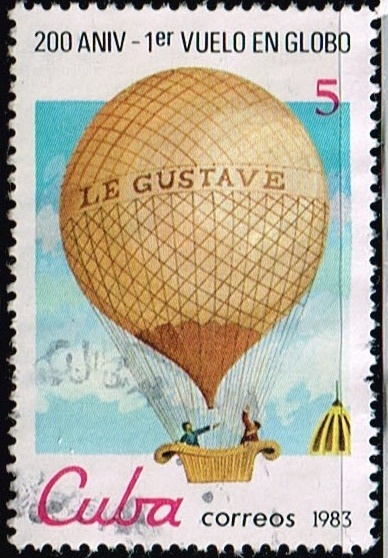 In 1936, for the 150th anniversary of his death but slightly late, France issued SG 546, showing him with a balloon in the background. A polar bear and snowman in a hot-air balloon. France SG 3356 of 1996, a Christmas stamp for the Red Cross. Like the design of that balloon, its like a upside down Christmas tree ornament. I don't know how I missed this topic when it was started! I have a small topical collection of balloon stamps. However I have no idea where I put it as I can't find it right now. Alberto Santos-Dumont (1873-1932) was a balloonist and pioneer aviator born in Brazil who spent most of his adult life in France. In 1901, in a dirigible (steerable) balloon, he won fame and a prize as the first person to fly from Parc Saint Cloud (near Paris) to the Eiffel Tower and back in less than 30 minutes. In 1906 he made the first powered heavier-than-air flight officially recorded by the French Aviation Club. He designed his own balloons and aircraft, and helped to develop monoplanes. He retired from aviation in 1910, and returned to Brazil in 1928, suffering from multiple sclerosis. He committed suicide in 1932 (though the official cause of death on his death certificate was cardiac arrest), and was given a state funeral. Here he is, with two dirigible balloons and one of his aircraft, on SG 1991 of 1973. 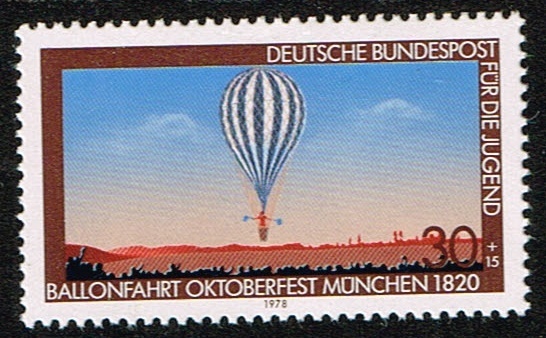 1978 German semi postal stamp Balloon. scott number B549 Balloon Ascent ,Oktoberfest ,Munich. 30pf + 15pf. Too modern for my 1982 catalog........1983 French balloon stamps. 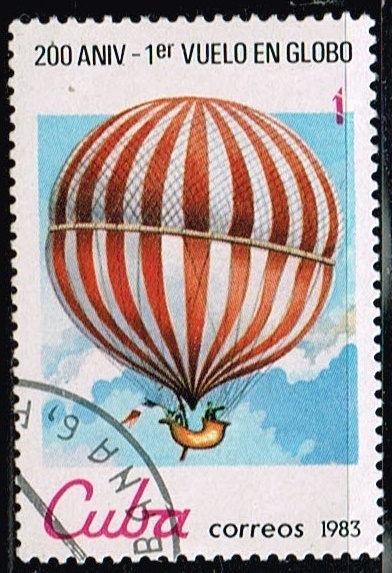 A French semi-postal of 1955 showing a depiction of the Paris balloon post of 1870. During the Franco-Prussian war of 1870-1871, Paris was besieged for about 4 months and balloons were used to communicate with the outside world, the telegraph wires having been cut. 66 balloons in all were sent, and most got through. 5 were shot down, and 3 went astray. It is thought that some two and a half million letters were sent by balloon. The balloons also carried pigeons for use in pigeon post. The siege ended with the fall of Paris, which led to the Paris Commune, and the establishment of the German Empire and the third French Republic.